Josh Mathews is a professional wrestler who was born on November 25, 1980. 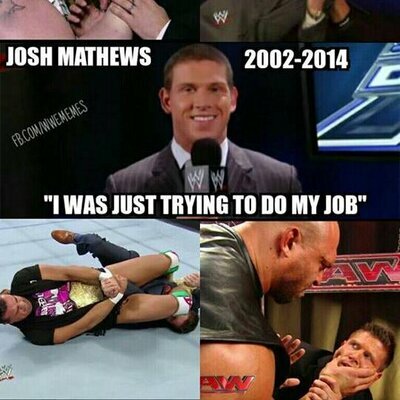 WWE Monday Night Raw and WWE SmackDown account for some of Josh Mathews's recent TV appearances. Josh Mathews's filmography includes Backyard Criminals, from 2003. Josh Mathews's Instagram account (@joshmathews) keeps a low profile with about 9,500 followers. Josh Mathews's recent posts to Instagram have gotten around 300 likes each. There are about 4 TV shows that have featured Josh Mathews as of 2018. Some of the most recent Josh Mathews TV appearances include WWE Monday Night Raw, WWE SmackDown, and WWE Saturday Morning Slam. In 2015, Josh Mathews commentated on and hosted WWE Monday Night Raw. Also in 2015, Josh Mathews hosted WWE SmackDown and Josh Mathews hosted WWE Saturday Morning Slam in 2013. There is only one movie featuring Josh Mathews as of 2018. Backyard Criminals is the only recent movie featuring Josh Mathews. Backyard Criminals was released in 2003.